When we started this blog, I was afraid that I wasn't going to be able to find enough information for ideas and posts. 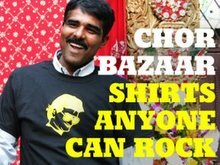 Thanks to the media, we have been able to find a deluge of South Asian exploitation. 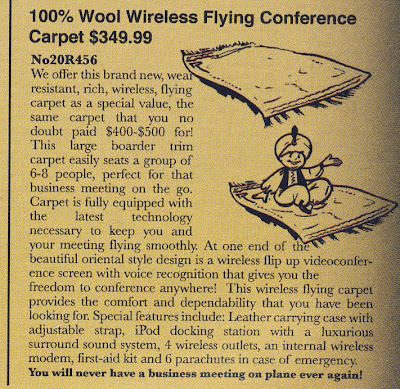 The following images are from Metropolis Magazine April 2007, article name, "The Portable Workplace". The article speaks about the compact designs for computing and communication in future designs. The images were extracted from a larger image that portrayed items like an old fashioned "Sears" catalog. One had to really read this satire to find them, but there they were in fine print. 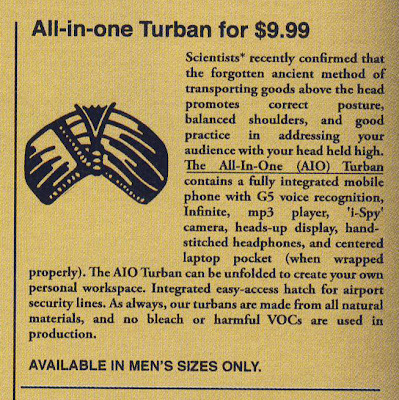 Sure they seem fun on the surface, but the All-in-one Turban for $9.99, might have some heads rolling, no pun intended.